SDI : Who Are We ? After Grenfell: Reliable Design, Supply & Construction Essential ! 2017-10-10: After the Grenfell Tower Fire Tragedy in London, on 14 June 2017, the integrity of the English Regulatory and Technical/Building Control Systems is now so compromised that a complete Systems Transformation is immediately required ! Closer to home, here in Ireland … what nobody is daring to say, even our tame media, is that Our Regulatory System is based very closely on the English System. And Our Technical/Building Control System is purposefully under-resourced … so it is weak and ineffective. 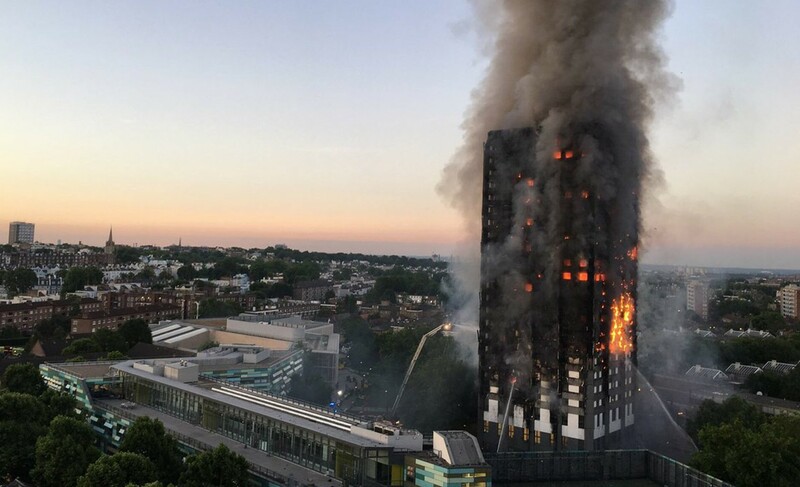 Colour photograph showing the Grenfell Tower Fire, in London … early in the morning, after dawn, on Wednesday, 14 June 2017. Harsh, tragic Reality ! Click to enlarge. So where do we start again ? Reality – Reliability – Redundancy – Resilience ! Regular inspections, by appropriately qualified and experienced personnel familiar with the design, and independent of both the design and construction organizations, are carried out to verify that the works are being executed in accordance with the design. Could Rapid Build Housing mean Rapid Fire Spread? | Michael Tweed B.A. B.Arch RIBA MRIAI | BRegsForum on Recent Terenure Terraced Housing Fires – Party Wall Failures !! Brendan Thomas on Recent Terenure Terraced Housing Fires – Party Wall Failures !! CJ Walsh on Recent Terenure Terraced Housing Fires – Party Wall Failures !! 'Spirit of Ireland' Project – National Energy Independence. At last … some 'real' Innovation in this country ! 2bscene Web Design & Development – Dublin, Ireland. E-PRTR – European Pollutant Release and Transfer Register … a Europe-wide register providing easily accessible key environmental data from industrial facilities in EU Member States and in Iceland, Liechtenstein & Norway. EU Fundamental Rights Agency – The Agency focuses on the situation of fundamental rights in the European Union (EU) and its 27 Member States. Ireland – Information about our Public Institutions, including Pretty Pictures of our green countryside ! Irish Seed Savers Association … Working to Conserve Irish Biodiversity. They research, locate, preserve & use traditional varieties, cultivars of fruit, vegetables, potatoes & grains. Senator Shane Ross – Ireland's Principal Economics Troubleshooter. What happened to George ? Survivors of Institutional Abuse Ireland [SOIAI] – WE (collectively) did not cherish all the children of OUR nation equally ! WikiLeaks – A non-profit media organization dedicated to bringing important news and information to the public. WISE – Water Information System for Europe … a single location (portal) where geographically-mapped information on water-related issues can be found for the whole of Europe. Copyright © 1995-2018 Sustainable Design International Ltd.
All Rights Reserved - Tutti i Diritti Riservati.